I gave a talk at the University of Maryland today (that’s where I work) as part of its “Semester on War and Representations of War.” A little odd to come out to friends and colleagues as a (war) gamer, but generally an interested and receptive audience. I had copies of several different games out to show, including Avalon Hill’s hoary Afrika Korps and something more recent, Bowen Simmons‘‘ Napoleons Triumph. One of the byproducts of the event was getting to meet a couple of new local gamers, including the gent behind Flash of Steel, where there is a nice write-up of the proceedings. From there I also stumbled across this entry on Soren Johnson’s Designer’s Notes blog (such an obvious title for a game design blog too—now why didn’t I think of it?). finally, the new spaces they open for representation and rhetoric, to which end I briefly discussed War on Terror, as well as the computer game September 12th. Lots of good feedback afterwards, including people asking if this is something I write about. Speaking of which, I see Pat Harrigan and Noah Wardrip-Fruin’s Third Person, in which I have an essay on board wargames, is listed as out in May 2009 from MIT Press. “Several polyhedra in various materials with similar symbols are known from the Roman period. 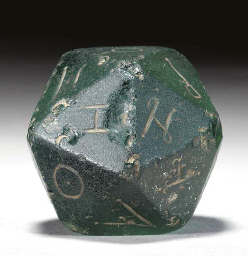 Modern scholarship has not yet established the game for which these dice were used.” Apparently it was from the collection of a Maryland Fine Arts professor. Hmm. Wargames have been published covering virtually every conflict in human history; in levels of complexity ranging from almost childishly simple to bewilderingly complex. Some, such as History of the World, give each player complete control of an empire, and have each turn represent years of real time; others, such as Advanced Squad Leader, are resolved at the level of the individual soldier, and have each turn represent seconds. Wargames have been created to simulate conflicts in hypothetical science fiction or fantasy universes and even professional sports, an interesting example of a three-dimensional game being used to simulate a two-dimensional game. Wargames are not storygames, as they do not in any real sense ask their players to play a role inside their storyworlds; but those storyworlds can be very compelling, and can almost seem to have a life of their own. Although most were designed for ostensible play as two or more player, agonal games, a surprising number of players play alone, moving each side in turn and letting the conflict unfold in their imagination. . . . Given the fascination these simulated worlds hold for their players, the next step – going “inside” these worlds to play roles there, rather than observe from the outside – was perhaps inevitable. I take up similar issues in an essay that will be out next year as part of the Third Person collection from MIT Press, edited by Pat Harrigan and Noah Wardrip-Fruin; I make claims about the significance of wargames as ludic vehicles for narrative or, more properly, narrativity, largely on the basis of procedural granularity—that the intricateness of the typical wargame’s rules and procedures is generative from the standpoint of storytelling, as evidenced by the popularity of so-called “after action” reports retelling game sessions (a tradition that goes back several centuries at least). Debord described his game as being based on Clausewitzian principles, a study in 19th century warfare and the importance of lines of communication. The scenario is a clash between symmetrical forces of infantry, cavalry and artillery. Debord’s game is therefore in the tradition of Tactics II and (going back farther) some of the military chess variants, such as the one designed by A.S. Yurgelevich in 1933. I think this balance of military power is where Debord (and similar wargames) depart from Clausewitz. The key aphorism from On War is war represents the continuation of politics by other means. Debord’s offering, however, divorces the conflict from its political aspect. These two nations are equally powerful and, on paper, possess no intrinsic advantage over one another. Furthermore, they can only triumph by either the complete destruction of the other’s army or the seizure of his two arsenals (which requires conquering one’s way to the back of the map). Consider the situation – two equivalent nations of equal might have decided to wage a war to the death. Wars are avoided under these conditions and, when they must be fought, are not begun with the idea of fighting to the finish. Conflict normally results from the perception of weakness, either in the present or forthcoming in the future. Germany, in 1914, sees Russia rearming and Russian officers enthuse to their Prussian counterparts about how they will crush them once the projected modernization is complete. The foes of the French Revolution see a threat to the infrastructure of their own countries from revolutionary ideals – then, as the Allied armies meet with defeat after defeat, Napoleon sees the potential to turn battlefield victories into Empire. By failing to make credible the calculus behind its struggle, Debord’s game fails to grasp the essential, enticing element of Clausewitz’s narrative of war. What players are left with is an engagement between equal antagonists where the defender enjoys the advantage. (*) Units in A Game of War are stronger on the defense than on the attack and the limited number of moves allows a defender to bring more force to bear where counterattacking. The only recipe for success under these conditions is for a player to overstack a wing of his army (as I did against Matthew in our game) to attempt to attain decisive local superiority. The historical answer to such a strategy is for the defenders to cede territory for time, seeking to draw the invaders forward and strain their lines of communication. But Debord’s game gives players no incentive to fall into this historical pattern. I possessed no reason to push my forces forward after seizing what I could from the initial encounter battle. Taking territory from Matthew brought me no closer to victory and did not weaken his forces through desertion or despair. My army cost me nothing to sustain as a force in being – I could maintain it for the length of the game in place without any cost to my society. The clash between equal antagonists (as one might expect), is therefore likely to lead to stalemate (Columbia’s Wizard Kings often ended this way). What’s missing is an underlying narrative to drive the action. Imagine a different scenario – one where Matthew starts with an army enrolling, say, half the infantry of mine, but with two scheduled drafts of conscripts which will ultimately make his force half again as large. Now, when we sit down at the table, my incentives are obvious – I must attack while I enjoy superiority in force and, if need be, risk my whole army to do so. As I played A Game of War, I found myself considering these other, more fertile variations. What if my country enjoyed the advantages of the Chassepot rifle or Krupp gun? What if I chose to deploy a small corps of hardened professionals against seemingly endless waves of peasant conscripts? These are scenarios which both fire the imagination and evoke the stories of 19th century war; not this dry confrontation of symmetrical powers fielding identical military systems. Creating a game about war thus requires more then selecting military units and engineering a system – it is about framing the narrative of the conflict between the players. War, even in the abstract, cannot be removed from political realities. To depart from this model is not only to lose the essential element of war, but also an essential element of the game itself by removing players’ incentives to take action. (*) – assigning the advantage to the attacker (as Chess does with its system of captures) can create a different dynamic – players are driven to aggression against the other side because the defense is made untenable. Stalemate can still result in the endgame as capability wanes from the destruction of a player’s more capable units. From watercoolergames, Wolves Evolve, and VirtualPolitik comes the astonishing news that the estate of Guy Debord has issued a cease and desist to Alex Galloway for his Radical Software Group’s recent implementation of Debord’s Game of War (Kriegsspiel). As woeful and bizarre as I find that news, the ensuing discussion in the blogs and comments has manifested some terminological confusion over the use of the word Kriegsspiel (the title Galloway employs for Debord’s Le Jeu de la Guerre, A Game of War). Kriegsspiel, of course, is German for (literally) “war game.” In 1824, the Prussian staff officer Georg von Reisswitz formally introduced the game (versions of which had been kicking around in his family for years) to his fellow officers. (“This is not a game! This is training for war!” one general is said to have exclaimed.) It was quickly adopted, and became the foundation for the German use of wargaming which persisted through World War II (these are the “sand table exercises” of which Friedrich Kittler writes in his cryptic preface to Grammaphone, Film, Typewriter). 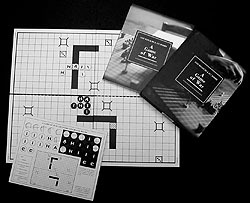 Some, however, have interpreted the tradition of the German Kriegsspiel and Debord’s apparent use of the same title as evidence that Debord’s game is itself a derivative work, and that Galloway’s implementation of it is simply another instance of the game’s progression since the early 19th century. Debord’s game bears only the vaguest generic resemblance to the tradition of Prussian Kriegsspiel. 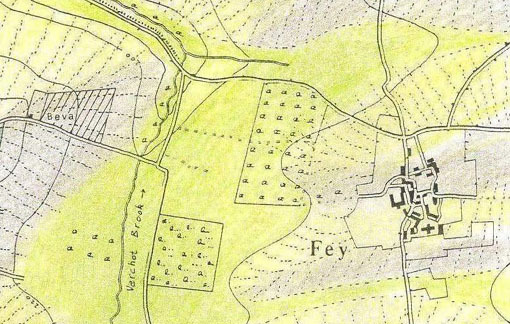 The Kriegsspiel was played on actual military topographical maps, often of terrain that was anticipated as the scene of future conflict (for example, the Schlieffen plan was subject to extensive rehearsal as a Kriegsspiel, using contemporary maps of the Ardennes). Debord’s game, by contrast, is played on a gridded board that depicts two abstract nations or territories, more or less symmetrical in terms of geographic features. 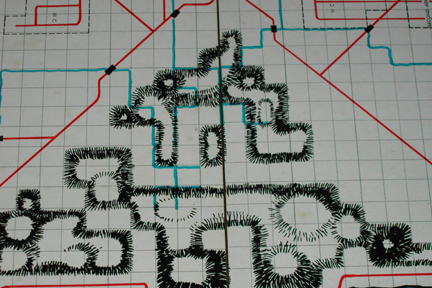 Above is a small section of the so-called “Meckel map,” the 1:7500 map set that became canonical for play of early Kriegsspiel, alongside of the 2007 Atlas Press print edition of Debord’s game. There are some important differences, however, between Roberts’ designs and Debord’s. Roberts introduced the use of the Combat Results Table, basically a Monte Carlo table with a distributed set of outcomes based on odds ratios of the combatants. To resolve an engagement, players tote up the odds of the forces involved, add modifiers or column shifts for terrain and the like, then roll a die and consult the table to determine the outcome. In Debord’s game, by contrast, combat is deterministic. One calculates the total number of offensive and defensive points that can be brought to bear on a contested grid square, and based on those numbers the defending unit either retreats, is eliminated, or holds its ground. Nothing is left to chance. Perhaps. But it’s worth noting, that while absent from games like Chess and Go, such lines of communication had been a standard feature of commercial board wargames in Roberts’ tradition since at least the 1968 (fateful year) publication of James Dunnigan’s 1914, a strategic level game on the First World War. As typically expressed, the mechanic requires units to be “in supply” or else suffer grievous consequences. Being in supply means being able to trace a line of contiguous hexes, free from enemy units or their “zones of control” to a friendly map edge or supply depot. In practice, this sometimes required excessively “gamey” tactics, as players would trace elaborate looping lines of supply, skirting enemy units to eventually corkscrew around back to their own rear areas. Debord’s lines of communication are much less forgiving, their hard geometries undeniably evoking something of the grid or the matrix that feels very contemporary (Gibson’s “lines of light” in the non-space of cyberspace). It would be fascinating to know what, if any, contact Debord has with board wargames from companies like Avalon Hill and SPI. We know, says Galloway, that he played political strategy games like Djambi. Board wargames enjoyed similar public popularity during the time when Debord was developing his Game of War, and it is not inconceivable that he would have encountered them. Your host in action yesterday at the Chantilly Game Parlor (I’m in the middle). I’m participating in a demo of OSG’s Habit of Victory, on Napoleon’s 1807 Polish campaign. Designers Kevin Zucker and Mark Herman were both there; that’s Mark eating a cookie. Arrived yesterday. Edited by James Lowder (Green Ronin, 2007), it’s surprising no one’s done this before: ask prominent game designers to write about their favorite games. So you get Richard Garfield on Dungeons and Dragons and Gary Gygax (RIP) on Metamorphosis Alpha, Steve Jackson on Paranoia and Erick Wujcik on OGRE. 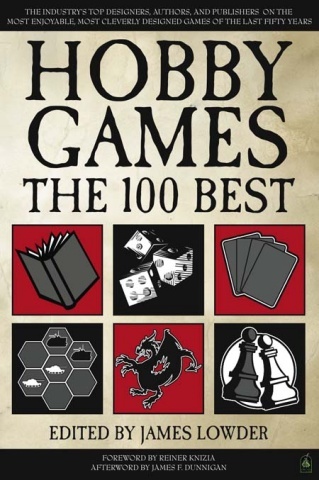 Collectible Card Games, RPGs, Euros, and wargames are all represented, even some miniatures. 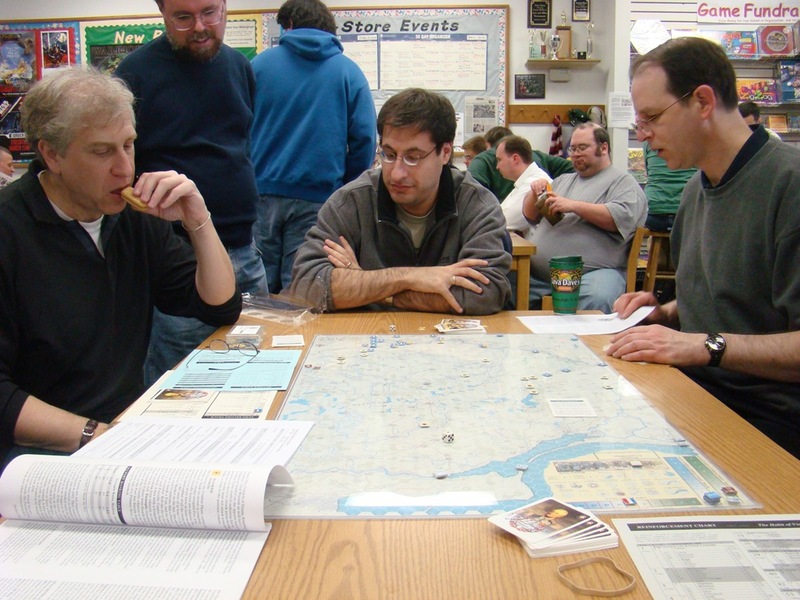 Wargame titles include Thomas M. Reid on Axis and Allies, Tracy Hickman on Battle Cry, Skip Williams on Dawn Patrol, Alessio Cavatore on Empires in Arms, William Jones on Flames of War, Lou Zocchi on Gettysburg, Gav Thorpe on Hammer of the Scots, Uli Blennemann on Here I Stand, Craig Taylor on A House Divided, Dana Lombardy on Johnny Reb, Ted Raicer on London’s Burning, Chris Klug on Napoleon’s Last Battles, John Scott Tynes on Naval War, Mike Bennighoff on PanzerBlitz, Joseph Miranda on Renaissance of Infantry, Ray Winninger on Squad Leader, Lewis Pulsipher on Stalingrad, Douglas Niles on Terrible Swift Sword, Zev Shlasingle on Twilight Struggle, Sandy Peterson on Up Front, and R. A. Salvatore on War and Peace. Each entry is about three pages long, and, in a nice touch, they’re presented alphabetically by game, making it easy to look up titles. And a few lines later, “Thanks to John Wayne and Lee Marvin, it was relatively easy for gamers to translate the action of the game board into ‘real’ battles in their imaginations, lending the whole experience a lively, escapist quality. (By contrast, try to imagine exactly what a ‘2-to-1 attack’ on Leningrad looks like)” (288-9). From the first release of the first edition, players were empowered to create and arm their vehicles from the ground up, and they had lots of options. They were free to obsess over such minutiae as the weight and cost of the individual rounds with which their recoilless rifles were loaded. And not for nothing: trading a bit of ammo for a point or three of armor could spell the difference between life or death in the arena! By the time the various—and definitive—boxed Deluxe Editions were released in the mid-’80s to early ’90s, the game burst with options, from flaming oil slicks to tank guns, to laser-reactive webs to fake passengers. One of my favorite wargames growing up in the eighties was NATO: The Next War in Europe (Victory Games). This was a Warsaw Pact invasion of Western Europe. For a kid who had just read his first Tom Clancy novel, it was heady stuff indeed. Massive columns of Soviet armor rolling across the border, a desperate defense, a maelstrom of modern weaponry. Whoah. Although it was the hot topic during the eighties, I never thought I would have any interest in NATO vs. Warsaw Pact gaming again. I was surprised, though, by how much fun I’ve been having with Lock ‘n’ Load’s Word at War: Eisenbach Gap, a smash-mouth shoot ’em up that gives you Team Yankee facing off against platoons of T-72s. So this past week I set up the old NATO game with its now obsolescent future, and once more the red columns came rumbling through Fulda and across the North German plain. Any game on NATO‘s scale has to deal with the nuclear option. Gamers being who they are, how do you keep them from just pressing the big red button right around turn 2? Eisenbach Gap is able to sidestep that question because it’s really not much more than a firefight game. NATO, however, offered an ingenious solution. Here’s how it worked. As a kid, playing NATO solitaire, I approached this decision, and the die roll that followed, with the greatest solemnity. I would make myself wait and come back to the game table a couple of hours later to see if I still really wanted to do it. If so, then I would toss the die the length of the room, to make sure I got a clean roll. And if I was unlucky, I would dutifully pack up the game and put it away. What I like about this mechanic is that it breaks the frame of the game. By forcing the player to risk something very real—not just prospects for victory, because every wargamer wins and loses lots of games—but the time and experience already invested in setting up and playing the game and all the potential play that still remained. All on a coin toss—no modifiers, just a straight up 50% chance of oblivion. Because let’s face it, having to pack up and put away a game prematurely is probably the only kind of nuclear deterrent a wargamer can understand. RIP Mordenkainen, and a fantastic adventure.